As the Spirit of Speyside Whisky Festival (SoSWF) enters its penultimate day, Sean Murphy realises how a tasting note challenge, whisky ice cream and Ann Miller’s tales of university with Charlie MacLean underpin whisky's innate ability to bring people together. Don’t ever let it be said that only men have a passion for whisky. Although throughout the course of the SoSWF so far the shortage of a female presence among tasting attendees was distinctly noted, women have had a marked impact on this industry right from the beginning. A quick trip to Dufftown’s famous Whisky Shop soon underpinned this sentiment, as owner Mike Lord’s wife Val greeted visitors for the annual Whisky Shop Dufftown Challenge. Her enthusiasm for the festival easily matched that of her husband's and anyone I’d encountered up until now. The challenge – a harmless blind tasting to discover the most creative whisky tasting note – quickly led to some serious competition among visitors, particularly in my motley crew of drinks writers whose professional skills were challenged. Though my tasting note may not have been voted the best, I believe it was the most original. On nosing one of the whiskies I definitely detected the not unpleasant aroma of what I can only describe as plastic toy soldiers. Each to their own. Aside from playing home to one of the region’s best whisky shops, the ancient burgh of Dufftown is brimming with attractions for visitors, particularly during the festival. 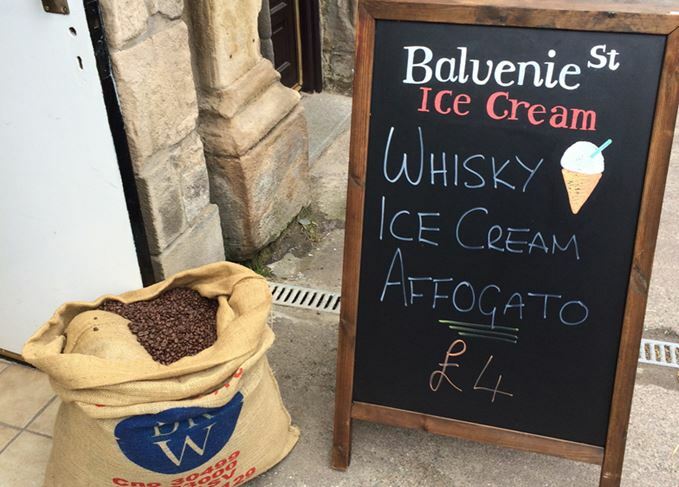 The High Street comes to life with barrel-rolling, ceilidhs and some of the tastiest whisky ice cream on earth. However, the highlight of the afternoon wasn't enjoying a cone of Balvenie Street Ice Cream Shop’s more-ish treats (I can't recommend the Bowmore flavour enough), it was spending time with Ann Miller, Chivas Brothers global brand ambassador, at the Craigellachie Hotel – in the room where the festival was originally planned, no less. During a three-course meal, expertly paired with whisky by Miller herself, attendees were entertained by anecdotes from her whisky career – from her days at university with internationally renowned whisky icon Charlie MacLean (I wish she'd had more time to divulge further tales from those days!) through to her career with Chivas Brothers and Seagram. It was fascinating to hear from the women who have really helped to make this festival, and indeed Chivas and the wider Scotch whisky industry itself, what it is today, and to gain an insight into the challenges women once faced as they battled to be recognised in an industry dominated by men. In the evening it was back to Dufftown for the closing ceilidh, and a chance to let our hair down once more and reconnect with some of the people we'd met and friends we'd made over the past few days at the festival. As well as to congratulate the team at William Grant & Sons, whose Glenfiddich 12, 18 and 21-year-old swept the board in the SoSWF Whisky Awards, becoming the first brand to achieve such an accomplishment. And, by dancing the night away with festival manager Pery Zakeri and chairman James Campbell, and catching up over a dram with Ann Miller and Cragganmore distillery manager Kevin Innes, I was once again reminded that though the whisky may be the spirit of the festival, the people are definitely its heart.